Have you ever known anyone with absolutely no impulse control? Someone who just lives entirely in the moment, thinking only of the current crisis or immediate desire? That, in a nutshell, is the titular Marie from Marcy Dermansky’s novel. In the past, her lack of foresight landed her in prison as an accessory to robbery and murder. Now, she’s working as a live-in babysitter for her former friend Ellen, drinking her days away, and pondering how she might seduce Ellen’s husband Benoît, who happens to be the author of a novel that saw Marie through her years in prison. Now that the TBR Dare is over, I’m finally reading some of the review books that landed in my TBR pile since the start of the year. This book was one I picked up at a galley giveaway at One More Page Books. I was a little skeptical about it, but the conversation surrounding it during the Tournament of Books got me more interested, and I ended up wolfing the whole thing down in one sitting (except for a short break to check on my cat—if you’ve read the book you’ll understand the impulse there). Marie is an absolutely awful character, but her antics make this book compulsively readable. It’s just one outrageous incident after another. After she gets caught drinking a whiskey while taking a bath with her toddler charge, Caitlin, she decides to step up her efforts at seducing Benoît before she’s kicked out for good. Next thing you know, Marie, Benoît, and Caitlin are on a plane to Paris. Her Paris adventures quickly sour, but she’s undaunted—she will enjoy herself, and even more important, she will take care of Caitlin. As terrible as Marie is, she is simply swept away by Caitlin. She’s not in any way a proper caretaker, but she never considers abandoning her charge. (Marie may be bad, but she’s no monster, unlike another character I could mention.) There’s something in her that hungers for the affection, the dependence, that she gets from this little girl. Dermansky reveals enough of Marie’s history to make her sympathetic, but she doesn’t sugar coat Marie’s actions. Caitlin is most decidedly not in good hands, but the comic, over-the-top nature of the book kept it from ever feeling quite like a child-in-jeopardy story. It’s just not a book to take seriously in that way. It might sound like this is a sentimental book about how a child turns a free spirit into a responsible adult, and to some degree it is. But Dermansky deftly avoids turning this into a sappy heart-warming story about the softening influence of a child. By the end of the book, Marie has changed, but there’s no tidy resolution. It’s a surprisingly satisfying read. Heh. I don’t know anyone quite as extreme as Marie, but I’ve known my fair share of people who can’t think beyond the moment. They’re exasperating to know, but less exasperating to read about! This is the first review I’ve read of Bad Marie that makes me consider picking it up. I was extremely skeptical but the TOB (and Frances’s praise) turned me around. Getting it free helped, too! I agree with Vasilly. I’ve been on the other side of the fence; now I’ve jumped over and I definitely want to read it. I do hope you enjoy it–and that I haven’t oversold it. Marie is a train wreck of a character, but the book is well nigh impossible to put down. This sounds like it would make a great movie. Maybe a French film, dark and comical. Yes! 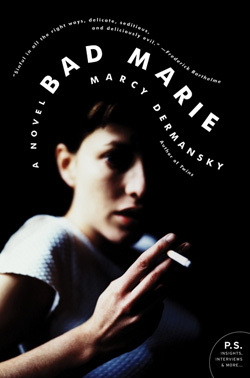 I actually read somewhere (can’t remember where) that Dermansky was inspired by French film when she wrote the book! Marie was/is quite the hot mess, isn’t she? What an unforgettable character. It was impossible to put down, wasn’t it? And I had to solemnly promise my cat that I would always be here to open her cans of cat food, or I would ensure someone else came to do it, LOL. Heh. It’s pretty infrequent that I get in the perfect mood for a book like this, but when it happens, and I have the right book to hand, it’s pretty awesome. Will have to keep this one in mind for the next time the urge hits. I’m particularly reassured by your discussion of how Dermansky avoids the traps of sentiment to which this basic plotline could so easily fall victim. This was absolutely right for my mood this weekend. I’m usually extremely averse to the particular brand of sentimentality that this story could fall into, but Dermansky gets it just right. Marie softens up enough that I didn’t end up hating her, but not so much that I was rolling my eyes. I felt so uneasy about what could possibly happen next throughout this book, as almost everyone was so vulnerable – that was really well done. A good read. I know what you mean. I had a feeling that things wouldn’t turn out horribly, but I wondered how awful things would get. Sounds interesting. I’ll add it to my list. I just love the title of this book and have been keeping my eye on it as I too have read lots of positive reviews. This seems to have been a surprise hit for many people. It definitely took me by surprise!